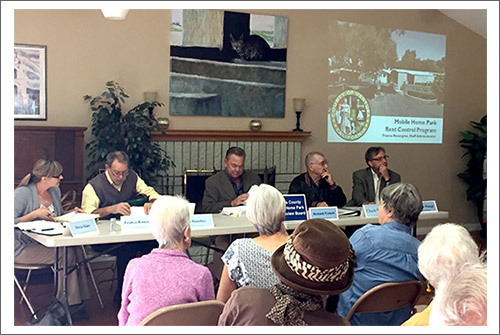 The Ventura County Board of Supervisors appointed a five member Mobile Home Park Rent Review Board (RRB). The RRB is responsible for rent stabilization through the Mobile Home Park Rent Control Ordinance (Ordinance). RRB Staff reviews mobile home park owners’ proposed rent change applications for completeness and consistency with the Ordinance, which was adopted to protect the owners of mobile dwelling units (i.e., homeowners) from unreasonable rent increases, while at the same time recognizing the need of Mobile Home Park Owners to receive a fair return on their investment and rental income sufficient to cover expenses. The RRB meets quarterly in February, May, August, and November at 1:00 p.m. in the Multipurpose Room, which is located on the third floor in the Ventura County Government Center, Hall of Administration Building, 800 S. Victoria Avenue, Ventura, CA, 93009. All Rent Review Board meetings are audio recorded. A copy of an audio recording of a Rent Review Board meeting may be purchased for a fee. For more information, please contact Ms. Rosengren at the contact information provided above. On May 6, 2014, the Board of Supervisors approved and adopted amendments to the Mobile Home Park Rent Control Ordinance. The most current version is Ordinance No. 4462, which became effective on June 5, 2014. There are 26 mobile home parks located in the unincorporated Ventura County that are regulated by the Ordinance. Only the Oak Haven Mobile Home Park, located in Supervisorial District 1, is entirely exempt from the Ventura County Rent Control Ordinance due to its date of construction having occurred after 1982 (Section 81002(b) of the Ventura County Rent Control Ordinance). Most of the mobile home parks in unincorporated Ventura County (18 of 26) are located in Supervisorial District 1. The remaining eight mobile home parks are located in Supervisorial Districts 2, 3, and 5. Supervisorial District 4 has no mobile home parks subject to the Ventura County Rent Control Ordinance. The Ordinance specifies that the RRB render “a tri-annual comprehensive written report to the Board of Supervisors concerning its activities, holdings, actions, results of hearings, and all other matters pertinent to this Ordinance which may be of interest to the Board of Supervisors.” (Section 81004 (e) of Ordinance No. 4462). Below is a list of historical status reports for the Ventura County Mobile Home Park Rent Control Program.